I’m excited. 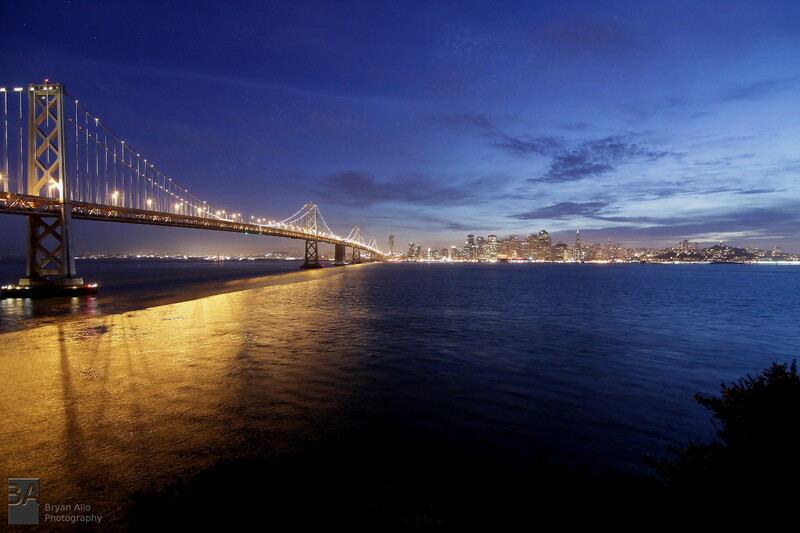 I finally got around to finishing post processing on all the frames I shot for a time lapse of the SF Bay Bridge at sunset last Sunday. 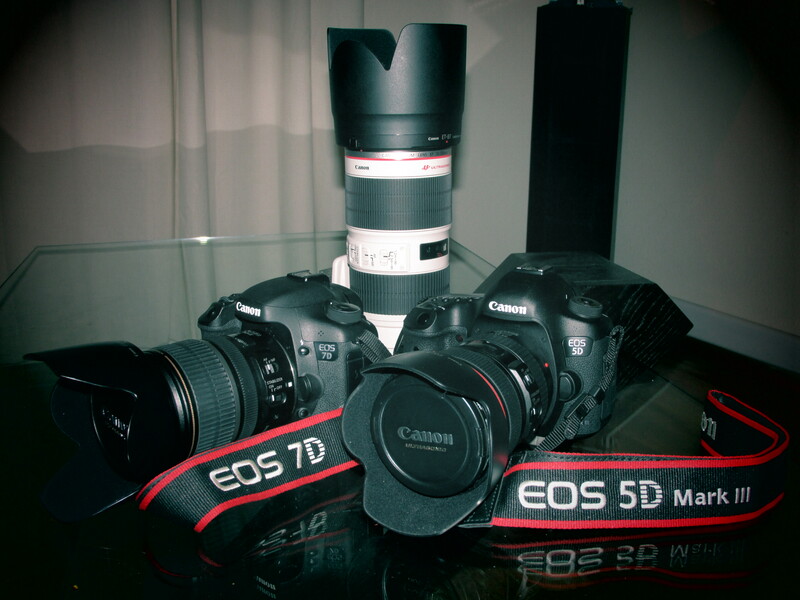 I took about 4000 shots between both the 7D and 5D MkIII. 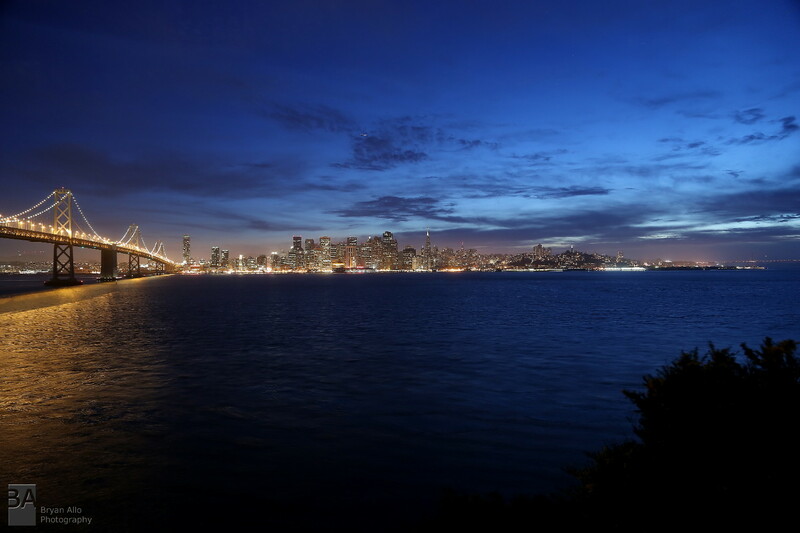 Each set should yield about 1 minute of time lapse footage covering the 30 minutes before and after sunset. I stretched the enterval on the 7D and set it run for two hours at 4 second intervals which also yields about a minute of footage. While I have done tons of time lapses before every one is different. No two lapses are the same. Especially under changing light conditions which makes it very tricky to predict what the light conditions will be at the end of your lapse period and what kind of exposure will the camera need at what ISO and aperture, in order to keep up with the intervalometer. It’s a different kind of photography. It also forces you to drop the details and focus on the big picture. I like that I can crank up to ISO-1600 and not have to worry about the effects of noise because it is of very little consequence to the end result. In contrast I don’t like that I have to leave my aperture wide open in anticipation of a low light scene and shutter speed limited by my interval. This always creates a softer image. Enter post processing and Canon DPP. Changing light conditions also introduce my biggest peeve – flickering frames. As the light in the scene changes the camera (in AV mode) constantly tries to meter the light and when it approaches every stop of exposure it tends to dance back and forth before committing to the new value in the sequence. Up until recently I had no way of correcting this without expending tons of cash for software licenses. I recently found an Open Source solution (right up my alley) called VirtualDub and so far it’s doing a really good job of taming my sunset/sunrise time lapse frames. VirtualDub will definitely require a separate post or posts. For this lapse, I used partial metering instead of evaluative metering. This greatly reduced frame flicker. One of the many measures I’m experimenting with to reduce the amount of work in post processing. Below are sample mid-sequence frames from last weekend’s exploits. The Tokina is a little soft on the edges but most of the blur was due to the wind which picked up considerably as the evening progressed. One of the many nuances of SF. I hiked through some sketchy parts to get this view. Sometimes I wonder if I’ve gone crazy. UPDATE: I posted more thoughts on this subject and a reader’s comment Here. So I just remembered tonight there was a full moon. I hurriedly pulled out my camera gear (it was already close to 10:30pm) and headed for the back yard. There were some nice clouds passing over the moon and I thought it should make for a great time lapse. Then wondered what camera should I use?? I remembered the 7D and my 70-200mm f/2.8 IS II gave me a spectacular image with the ease of a point and shoot. But that was over a year ago and now I have the 5D Mark-III. But then I thought it’s full frame sensor meant less coverage of the point in the sky (moon) I was trying to photograph. But it had a technically superior sensor and higher overall resolution. I thought this might be enough to match the high pixel density of the 7D. I was wrong. This was one of the classic examples of a situation where the 7D is just a way better camera for the job hands down. Both shots were at f/4, ISO-100 and 1/1000 second. AF on and IS on (mode 1). At ISO-100, there was no advantage to the newer 5D Mark-III sensor. Both were right at home with the higher shutter speed. AF was spot on and on the 7D seemed a hair more confident/quicker than the 5D Mark III. Yes, I know the DIGIC5 processor is supposed to be 17x faster than the DIGIC 4 but as a software engineer I’m pretty sure having a processor dedicated to AF (7D has Dual DIGIC4 Processors) means parallel AF processing. In real life it’s either a wash or still a better performing configuration than a single DIGIC5. This simple quick and rough test just confirmed my suspicions and what I’ve always tried to explain to some fellow photo geeks. Just because it’s a full frame camera does not necessarily mean it captures more detail in the true technical sense. 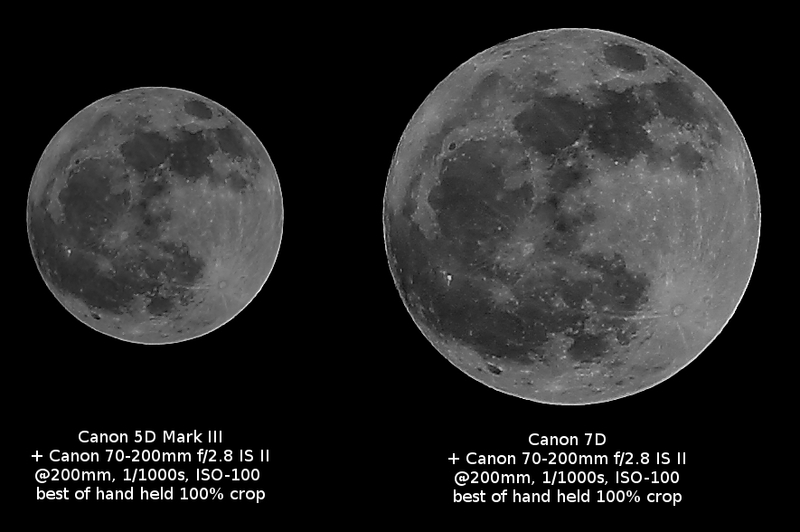 The comparison here shows the 7D delivering the full moon with easily 2 times the number of pixels the 5D Mark-III and with similar clarity and sharpness using the same lens and settings. I still maintain, for most other general scenarios and large field of view the 5D Mark-III will yield a superior image. However the 7D with it’s considerably higher pixel density will always yield much more detail (in this case, twice the detail). This is one of the many real life, real world scenarios that no ISO-Chart, spec sheet regurgitating blogging, rent-a-camera-for-a-weekend-reviewer will ever tell you. If you haven’t yet figured it out, I pretty much loathe most of the talking/blogging heads on the web just echoing whatever everyone else says. This is one reason why I still hang onto my 7D. It is an amazing camera system. However it is imperative that a 7D owner only mount the best lens optics that money can buy because of the unforgiving and high pixel densities. The key is to know your shooting style, know and understand your camera system to make full use of it’s potential. Yes I do own both camera systems and actively shoot both. What I enjoy most about photography is that I never really know what beauty awaits, but I do know when it arrives, I’ll be there to take it all in. My day was done early and I had been having a little bit of an itch to capture the sunset with a time lapse. I also hadn’t taken my 7D out since I got the 5D Mark III. 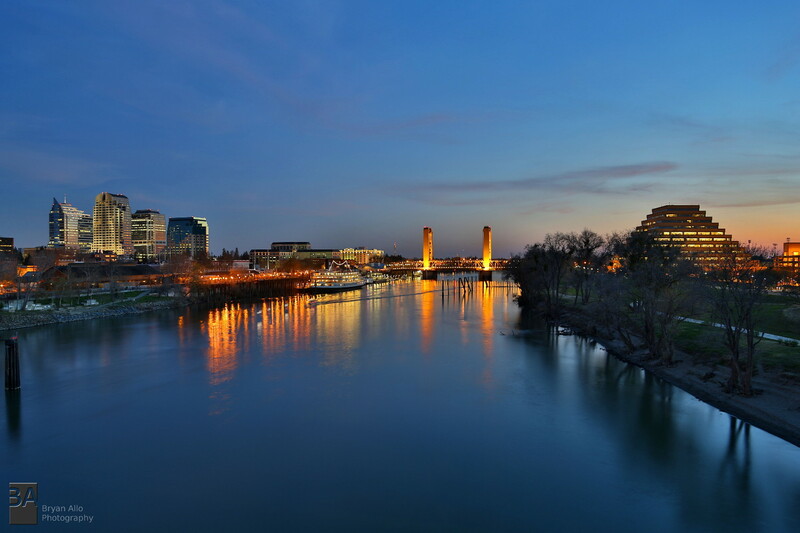 So I decided to head down to Old Sacramento to explore a nice vantage point to take in the view, lights and changing colors of the sunset. This was the main reason why I bought a second body, so I can pull double duty on my photo outings. During the last few years I’ve found myself having to make several trips to the same location just to capture my stills and time lapses. Add to that unpredictable weather and it becomes quite expensive to get the shot I want. I set the 7D up for the time lapse and let it run, while I took my time soaking up the view and trying various takes on the scene with the 5D Mark III. Here is a shot from the 5D Mark-III. I used the in-camera HDR which works quite well actually. Here is the composed time lapse from the 7D. I probably should have let it go 20-30 minutes longer to soak-in the night lights, but not bad for a random evening. You can view full screen and full HD at 1080p for full detail and effect. Enjoy.